Entrepreneurship is encoded in the DNA of Rebecca White, director of the Entrepreneurship Center at The University of Tampa where she is James W. Walter Distinguished Chair of Entrepreneurship. “I come from a family of entrepreneurs and have been an entrepreneur for more than 20 years,” said White, who first learned about small business as a youngster working in her mom’s floral shop in rural Peterstown, West Virginia. White went on to earn an MBA and a doctorate in strategic management from Virginia Tech and found her way to academia before also starting companies including WhiteBoard Advising, which works with founders, business owners and top management teams throughout the business life cycle. She is currently a Keohane Distinguished Visiting Professor at UNC-Chapel Hill and Duke University. Having seen entrepreneurship from a variety of vantage points, White is committed to developing and building academic programs in entrepreneurship education with a focus on competency-based education. “As educators, we believe we can certainly make a difference and impact the lives of students with the discipline of entrepreneurship and by teaching what we call an entrepreneurial mindset,” White said. But there hasn’t been unanimity on what entrepreneurs should be taught. This realization led White to her passion of developing competency-based education for entrepreneurship. Some of the skills, knowledge and abilities that White points to as integral for entrepreneurs are the ability to recognize and assess opportunities, learn from failures, use creative problem solving, be resilient and the ability to create a company culture and pull together a team to build and scale. 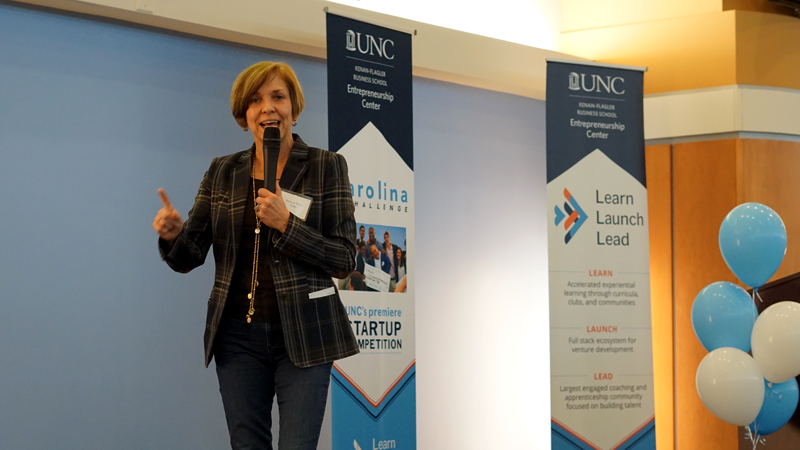 White’s focus on understanding the role that resilience has in entrepreneurship aligns with the research of Ted Zoller, director of the Entrepreneurship Center at UNC Kenan-Flagler Business School, on developing the entrepreneurial genome. White’s work in the Triangle is supported by a grant from the Keohane Distinguished Visiting Professorship, created by former UNC-Chapel Hill Chancellor James Moeser in honor of former Duke president Nannerl Keohane’s efforts to bridge the two universities. Entrepreneurship is one of the areas of focus for this year’s professorship. While White is able to research competency-based structures and develop models on her own, defining competencies for a discipline benefits from a collaborative approach. “Having a variety of people from multiple institutions, including my fellow Keohane professors, who add value by offering diverse ways at looking at issues, is an amazing experience in collaboration,” she said. While in the Triangle, White has been involved with a range of activities including serving as a guest speaker in Zoller’s Entrepreneurs Lab class; meeting with UNC’s innovation committee of more than 40 faculty members, looking at entrepreneurship across the UNC campus; learning from UNC researchers about the science of teaching and learning; and attending Duke’s innovation and entrepreneurship research symposium.